Sumner Carruth (1834-1892) was one of four brothers, raised on a West Parish farm, who served simultaneously in the War, and whose exploits were followed closely by the Andover Advertiser. Carruth attended Phillips Academy, and worked in Lawrence as a machinist, before moving to Chelsea where he raised cattle and drilled with the local militia. In April 1861, his company became Co. H of the 1st Massachusetts Infantry and he was elected its Captain. He fought in the first Bull Run (July 1861), and was wounded in the arm. 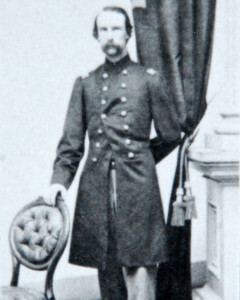 He returned as a Major in the 35th Massachusetts Infantry, rising through the ranks to Colonel and receiving a Brevet promotion to Brigadier General for his actions in April 1865 at Petersburg. Historian Gordon Rhea described Carruth’s involvement in the fighting on the Orange Plank Road the second day (May 6, 1864) of the battle of the Wilderness. The Andover Advertiser reported in November 1862 that Carruth had been captured (and quickly exchanged) while dining at a “secesh” house. In all, Carruth was wounded twice in action and twice taken prisoner.